So bad as to earn someone an extremely unacceptable reputation: "Benedict arnold, an American Revolutionary general, was guilty of the infamous crime of treason." 1. The disgrace to someone’s reputation caused by bad acts or behavior. 2. Shameful or criminal conduct or character. 1. The condition or time of childhood before a baby walks or talks. 2. An early stage of development for an idea, project, or enterprise. 3. The earliest period of childhood, especially before the ability to talk or walk has been acquired. 4. Etymology: from late Middle English; from Latin infantia, "inability to speak, childhood"; from infans, infant, meaning "not able to speak"; from in-, "not" + fans, present participle of fari, "to speak". 1. A very young child who can neither walk nor talk: "The little girl was spoiled and is often heard crying like an infant whenever she doesn't get what she wants." 2. A young person legally considered a minor. 3. Etymology: from Latin, literally “not speaking”; from infans, “not able to speak”. Perinatal (before and after birth), neonatal (first four weeks after birth), and infant (child up to 24 months of age) deaths in a given population. Referring to or pertaining to the murder of babies: "There have been and still are some infanticidal societies that kill unwanted babies to reduce the population; for example, during times of famine or, as in China, because the law allows only one child per couple." "There are also more infanticidal killings by mature adults of other animal species." 4. The practice of killing newborn babies. The education and social development of children. 1. Showing a lack of maturity; childish. 2. Relating to babies or very young children. A disorder occurring in childhood as a result of protein malnutrition: "A progressive fibrous liver ailment that is caused by protein malnutrition in babies is known as infantile cirrhosis." A condition of mental or physical underdevelopment, in which a person fails to mature sexually and emotionally; childish or immature behavior. Infant worship or the worship of a baby or babies: "Another term for infantolatry is babyolatry." 1. The soldiers or a unit of soldiers who were originally trained to fight on foot: "Traditionally, the young men who were not experienced enough to ride horses in the cavalry joined the infantry." 2. Etymology: from Latin infans, "not speaking" then Italian infante, "youth, foot soldier" and via French infanterie, to English. The term infantry was first recorded by John Wycliffe in 1382, infant comes from the Latin infans, "unable to speak". It once meant a "childe" or "a young knight, a youth of gentle birth" as well as a baby. So it is that we have the word infantry originally referring to foot soldiers, "soldiers who were too young and too inexperienced to serve in the cavalry". 1. An introductory section at the beginning of a book or speech that comments on aspects of the text: In the preface, the author generally tells why he wrote his book or what his intentions are. 2. To introduce an action, a speech, or a piece of writing. 1. Descriptive of an introduction to something; such as, the main body of a text or a speech: The chairman of the business meeting made some prefatory comments about what needs to be done to make more profits for the company in the near future. 2. 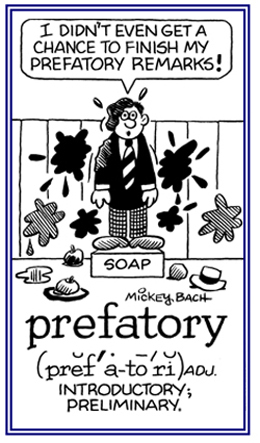 Etymology: from Latin praefatus, from praefari "to say before"; from prae-, "before" + fari, "to speak" + -ory, "relating to, doing." © ALL rights are reserved.